Hyponatremia is an important and common clinical problem. The etiology is multifactorial. Hyponatremia may be euvolemic, hypovolemic or hypervolemic. Proper interpretation of the various laboratory tests helps to differentiate the various types of hyponatremia. Treatment varies with the nature of onset -acute or chronic, severity and symptoms. Normal saline forms the mainstay of treatment for hypovolemic hyponatremia while 3% NaCl and fluid restriction are important for euvolemic hyponatremia. Hypervolemic hyponatremia responds well to fluid restriction and diuretics. There have been several recent advances in the last year with revision in the guidelines for treatment and availability of vaptans. Judicious use of vaptans may help in treatment of hyponatremia. Hyponatremia is a commonly encountered problem. The varied etiologies of hyponatremia and the multiple formulae for its correction make it a nightmare for the students and physicians alike. The guidelines for management of hyponatremia have been revised recently and, in addition new agents (vaptans) have become available in market for treatment of hyponatremia. The objective of this article is to apprise the clinician with the latest protocols for management of hyponatremia and current guidelines for the use of vaptans. Hyponatremia results from the inability of the kidney to excrete a water load or excess water intake. Water intake depends upon thirst mechanism. Thirst is stimulated by increase in osmolality. Thirst is sensed by osmoreceptors located in the hypothalamus and leads to the release of anti-diuretic hormone (vasopressin) from the posterior pituitary. Antidiuretic hormone acts on the V2 receptors located at the basolateral aspect of the collecting duct cells and leads to increased aquaporin expression on the luminal aspect of the collecting duct cells which increases water absorption and abolishes thirst. Hyponatremia occurs if there is persistent ADH stimulation which is seen in following situations. 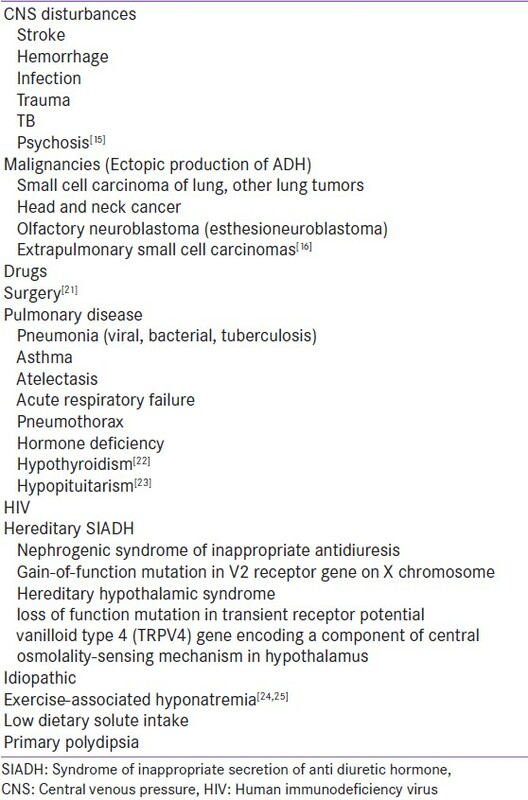 Abnormal ADH secretion e.g. Syndrome of inappropriate ADH release described below (SIADH). Acute hyponatremia is characterized by onset of symptoms <48h. Patients with acute hyponatremia develop neurologic symptoms resulting from cerebral edema induced by water movement into the brain. These may include seizures, impaired mental status or coma and death. Hyponatremia is classified as pseudo hyponatremia, true and translocational hyponatremia [Figure 1]. Normal serum osmolality is 280-295 mosm/kg. The serum osmolality (S Osm) can be calculated by the concentration in millimoles per liter of the major serum solutes according to the following equation: Sosm (mmol/kg) = (2 × serum [Na]) + (serum [glucose]/18) + (blood urea nitrogen/2.8). Pseudo (normo-osmolal) or isotonic hyponatremia is due to presence of hypertriglyceridemia or increase in plasma proteins in conditions such as multiple myeloma. In normal subjects, the plasma water is 93 percent of the plasma volume, fats and proteins account for the remaining 7 percent. Plasma water fraction falls below 80 percent in cases with marked hyperlipidemia (triglycerides >1500 mg/dL) or hyperproteinemia (protein >10 g/dL). , Here, the plasma water sodium concentration and plasma osmolality are unchanged, but the measured sodium concentration in the total plasma volume is reduced since the specimen contains less plasma water. In renal failure, the elevation in blood urea counteracts the fall in serum osmolality due to hyponatremia. However, the effective serum osmolality is appropriately reduced in this setting since urea is an ineffective osmole. Translocational (hyperosmolal) or hypertonic or redistributive hyponatremia is due to presence of osmotically active solutes in the serum e.g., mannitol or glucose. When the plasma contains significant amounts of unmeasured solutes, such as mannitol or radiographic contrast agents, plasma osmolality cannot be calculated accurately and must be ascertained by direct measurement. True (hypoosmolal) hyponatremia is associated with reduction in serum osmolality and is further classified as euvolemic, hypervolemic and hypovolemic ,, [Figure 2]. It is associated with low plasma volume. 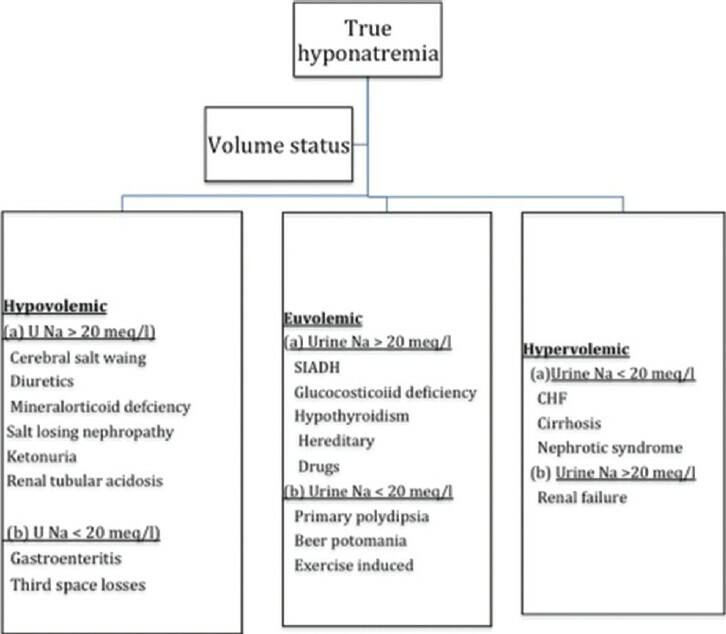 The causes of hypovolemic hyponatremia may be renal or non-renal [Figure 2]. 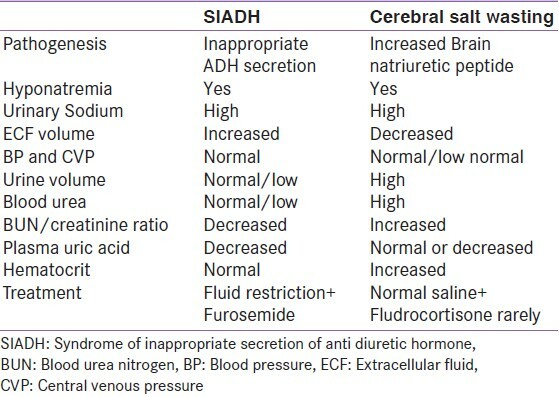 Cerebral salt wasting (CSW): Resembles SIADH [Table 1] except that in CSW renal salt wasting and volume depletion is the main defect with secondary rise in ADH whereas a high arginine vasopressin (AVP) level is the primary etiologic event in patients with SIADH [Table 2]. Diuretic-induced hyponatremia: Hyponatremia is common with use of thiazides, begins soon after initiation of thiazides, may be severe and is common in elderly females. Thiazide-induced hyponatremia, occurs due to increased water intake, reduction in diluting ability and water excretion in distal tubule. Sodium plus potassium concentration in urine exceeds that in the plasma, which directly lowers plasma sodium concentration. Loop diuretics cause inhibition of sodium chloride transport in the loop of Henle which prevents the generation of the countercurrent gradient and therefore restricts water retention by ADH. Hence hyponatremia is not common with loop diuretics. Furosemide-related hyponatremia tends to occur after many months of therapy, often when an intercurrent illness develops. Mineralocorticoid deficiency is another important cause of hypovolemic hyponatremia and may be associated with hyperkalemia. It is the most common and accounts for 60% of all cases of hyponatremia. 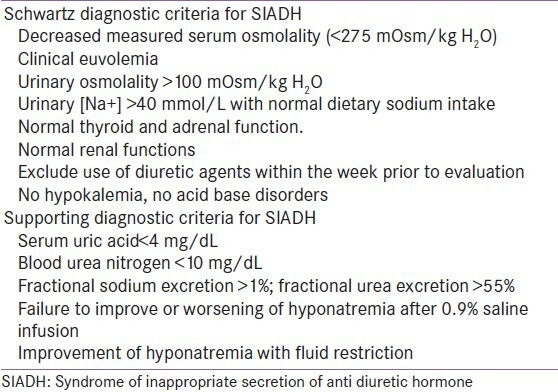 The commonest cause of euvolemic hyponatremia is Syndrome of inappropriate secretion of Anti diuretic hormone (SIADH). Other causes are shown in [Figure 2]. The criteria necessary for a diagnosis of SIADH were defined by Bartter and Schwartz in 1967. The essential and supporting diagnostic criteria are shown in the [Table 1]. The final criterion emphasizes that SIADH remains a diagnosis of exclusion and the absence of other potential causes of hypo-osmolality must always be verified. ,, The causes of SIADH are shown in [Table 3] and [Table 4]. Plasma sodium concentration (PNa) is given by ratio of the body's content of exchangeable sodium and potassium (NaE and KE) and total body water (TBW): PNa ≈ NaE + KE/TBW. TBW depends on urine volume. Urine volume cannot be increased in SIADH. This occurs because of defects in Antidiuretic hormone (ADH, arginine vasopressin) secretion. Patterns of ADH secretion: In normal individuals, plasma ADH levels is suppressed when the plasma osmolality is below 280mosmol/kg, thus ingested water is excreted and ADH levels increase as the plasma osmolality rises above 280mosmol/kg. Type B -there is a modest and constant leak of ADH. Type D- is the least common. Osmoregulation is normal (i.e. ADH secretion varies appropriately with the plasma osmolality), but the urine is concentrated even with suppressed ADH release. There are 3 mechanisms (a) germ cell mutation in which the V2 vasopressin receptor is activated. (b) Production of antidiuretic compound other than AVP and (3) a postreceptor defect in trafficking of aquaporin-2 water channels, which mediate ADH action. The cause for defective thirst is not known. In some patients hypothalamic lesions that affect the thirst center, infiltrative diseases such as sarcoidosis can result in primary polydipsia. Patients with polydipsia should be evaluated with a computed tomography or magnetic resonance imaging (MRI) scan of the brain before concluding that excessive water intake is due to a psychiatric cause. There is no specific therapy for primary polydipsia. Limiting water intake rapidly raises the plasma sodium as the excess water is readily excreted. In long term limiting the use of drugs that cause dry mouth, restricting fluid intake and frequent weighing are useful. It is seen in congestive heart failure and cirrhosis of liver, nephrotic syndrome and chronic kidney disease. Even though the plasma and extracellular volumes is increased in heart failure and cirrhosis, there is ADH stimulation as described under pathogenesis. The development of hyponatremia is a poor prognostic sign. Hyponatremia occurs commonly in both acute and chronic renal failure, because the kidneys cannot maximally excrete excess ingested water. In contrast, hyponatremia is not very common in the nephrotic syndrome unless associated with a substantial decrease in GFR. However, with severe hypoalbuminemia of <2g/dL, intravascular hypovolemia may occur and lead to the nonosmotic release of AVP with subsequent retention of hypotonic fluids. Fluid restriction is the cornerstone of therapy. Drug and diet history, history of volume loss i.e. diarrhea, vomitings should be noted. Determination of volume status i.e. dehydration, oedema, ascites should be carried out. Patients with clinical signs of volume depletion (e.g. orthostatic decreases in blood pressure and increases in pulse rate, dry mucus membranes, decreased skin turgor) should be considered hypovolemic. When available, direct hemodynamic measurements can provide corroboration of the clinical impression. Signs of hypothyroidism or adrenal insufficiency should be noted. Also a detailed examination should be done to detect any CNS or lung lesion. Pseudohyponatremia (falsely low Na with normal plasma osmolality) is not seen if ISE with direct potentiometry method is used. However, many laboratory analyzers that measure sodium with ion-selective electrodes utilize indirect potentiometry in which the plasma sample is diluted before measurement; these analyzers will report a low sodium concentration. Flame photometers may result in low values of serum sodium as they measure the sodium only in aqueous phase. It differentiates true, pseudo or translocational hyponatremia [Figure 1]. Calculated serum osmolality may not reflect serum osmolality if other osmotically active solutes are present in the plasma. Hence, serum osmolality should be measured by osmometer, (IB). If osmometer is not available, random blood sugar, serum triglyceride and serum protein should be helpful in differentiating the three types. Each mg increase in blood glucose above 100 mg/dl decreases the serum sodium by 1.6 meq/l. When blood sugar is less than 200 to 300 mg/dl, hyperglycemia has negligible effect on serum sodium concentration. When serum triglycerides are above 100 mg/dl, for every 500 mg/dl rise in serum triglycerides, fall in serum sodium will be about 1.0 mEq/L. When serum protein is above 8 gm/dl, for every 1 gm/dl rise in serum protein, fall in serum sodium will be about 4.0 mEq/L. 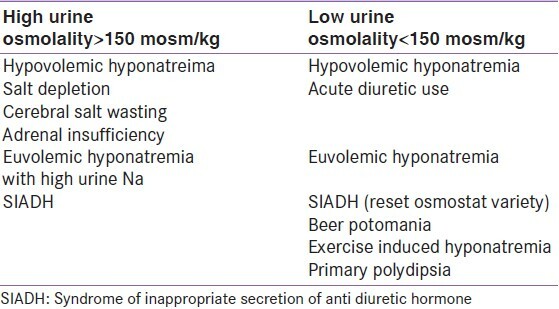 Urine osmolality can be used to distinguish between impaired water excretion and hyponatremia with normal water excretion [Table 5]. Impaired water excretion (Urine osmolality > 150 mosm/kg). The normal response to hyponatremia is marked suppression of ADH secretion, resulting in the excretion of a maximally dilute urine with an osmolality below 100 mosmol/kg and a specific gravity ≤1.003. Values above this level indicate an inability to normally excrete free water, most commonly because of persistent secretion of ADH. Determination of source of sodium loss-renal or non renal is the next step. This is done by measuring the urinary sodium losses. In patients with hypoosmolal hyponatremia and inappropriate urine concentration, the urine sodium and urine chloride concentrations can be used to distinguish between hypovolemic and euvolemic hyponatremia In hypovolemic hyponatremic patients who have metabolic alkalosis caused by vomiting, the urine sodium concentration may be greater than 20 meq/L, but the urine chloride concentration will be low (less than 20 meq/L). Clinical assessment of volume status is less accurate than urine sodium. If initial urine sodium concentration is equivocal, it could be difficult to differentiate true hypovolemia or euvolemic hyponatremia. In this situation serial monitoring of the urine osmolality and urine sodium concentration in response to the administration of 1litre 0.9% NaCl can help clarify the diagnosis. If the patient has SIADH, ADH release occurs independently of the volume status and the urine osmolality will remain elevated following 0.9% NaCl therapy. In both disorders, the urine sodium concentration will increase with saline therapy, although the increase in hypovolemic patients will not be seen until the hypovolemia is corrected. It is the sum of the urine sodium plus potassium concentrations divided by the serum sodium concentration. Fractional excretion of sodium (FENa) provides an accurate assessment of volume status than the urine sodium alone because it corrects for the effect of variations in urine volume on the urine sodium. In patients with normal renal function and hyponatremia cut off for FENa is <0.1%. >0.1%- hypervolemic and normovolemic hyponatremia. Thiazide diuretic-induced hyponatremia similar reductions in uric acid and urea levels can occur in patients with thiazide diuretic-induced hyponatremia where thiazides are used for water overload. In hypovolemia the levels of urea and uric acid may be normal or high. Mild metabolic alkalosis and normal K- is seen in hypopituitarism because of higher plasma aldosterone levels. In case of doubt, one can initiate 0.9% NaCl infusion with monitoring of serum sodium and follow-up at 6 to 8 h. Hypovolemic hyponatremia improves with 0.9% NaCl while hyponatremia in SIADH may not be corrected and usually worsens with 0.9% NaCl administration. Thyroid profile, ACTH and ACTH stimulation tests, CT/MRI brain and imaging of chest are done as needed. Chronic hyponatremia- It is generally asymptomatic or has mild symptoms. However; it may present with seizures if hyponatremia is very severe. If chronic hyponatremia is symptomatic (seizures or confusion) or is severe (serum sodium concentration below 125 meq/L aggressive therapy is indicated as for acute hyponatremia. 3% NaCl is recommended with or without vasopressin receptor antagonists. ,,, and Initial administration of 3% NaCl therapy is needed to raise the serum sodium by 4-6 mmol above baseline. Patients with mild symptoms (eg, dizziness, forgetfulness, gait disturbance) should be treated with less aggressive therapy. An alternative approach is the initiation of a vasopressin antagonist without fluid restriction. However, these formulae have limitations and cannot be used to accurately predict the magnitude of change in serum sodium and frequent measurements are necessary. In the current guidelines these formulae are not used. Instead 1ml/kg of 3% NaCl is estimated to raise the serum Na by 1meq/l. In addition water restriction, salt, urea, demeclocycline and vaptans are used according to the etiology. SIADH: It is important to rule out hypothyroidism and glucocorticoid deficiency before diagnosis of SIADH.The treatment of SIADH follows the same principles as mentioned above. Hyponatremia in SIADH is usually chronic and hence slow correction is needed. In cases of chronic hyponatremia or mild symptoms water restriction is the main cornerstone of treatment. Diurectics and vaptans are the other drugs used. In some severe, symptomatic or acute cases 3% NaCl is needed. 3% NaCl: Fluid must be given if the serum sodium concentration must be raised quickly because of symptomatic hyponatremia. The cation concentration of the administered fluid must exceed the cation concentration of the urine. 0.9% NaCl has a limited role in correction of the hyponatremia in SIADH and 3% NaCl is the fluid of choice. The amount of 3% NaCl needed can be calculated as per above formulae. Approximately 1 ml/kg of 3% NS increases the serum sodium by 1meq/l. Careful monitoring of the serum sodium is essential to prevent very rapid correction. Fluid restriction: The effectiveness of fluid restriction can be predicted by the urine to serum electrolyte ratio as described above. All fluids, not only water, must be included in the restriction; several days of restriction are usually necessary before a significant increase in plasma osmolality occurs; and only fluid, not sodium, should be restricted. Thirst, can be ameliorated by substituting hard candy or ice chips for drinking fluids. Diuretics: Concurrent use of a loop diuretic is beneficial in patients with SIADH who have a high urine to serum electrolyte (>1). Furosemide inhibits the sodium chloride reabsorption in the thick ascending limb of the loop of Henle and cause more of water loss than sodium loss (urine produced is like ΍ normal saline). Thiazides should not be used. Other drugs used for chronic SIADH are urea, demeclocycline and the vaptans. Demeclocycline: Causes a nephrogenic form of diabetes insipidus, thereby decreasing urine concentration even in the presence of high plasma AVP levels. Appropriate doses of demeclocycline range from 600 to 1,200 mg/day administered in divided doses. Treatment must be continued for several days to achieve maximal diuretic effects; one should wait 3 to 4 days before deciding to increase the dose. Demeclocycline can cause reversible azotemia and sometimes nephrotoxicity, especially in patients with cirrhosis and should be discontinued if increasing azotemia occurs. Vaptans: Role of vaptans in euvolemic hyponatremia is discussed below. Fluid restriction is warranted in hyponatremic patients with primary polydipsia in whom increased fluid intake is the primary problem. Glucocorticoid deficiency should be excluded by proper tests. Although glucocorticoid deficiency can be ruled out in some patients with a random or early morning cortisol level >18 mg/dL, failure to achieve this level will require consideration of a cosyntropin stimulation test for a definitive diagnosis. Treatment consists of Glucocorticoids for adrenal insufficiency (suppress ADH).As risk of ODS is high general guidelines for chronic hyponatremia should be followed. Psychosis-Antipsychotic drug clozapine is useful in at least some psychotics. Vaptans are not recommended for hypovolemic hyponatremia (see below). Role of Vaptans is discussed below under section on vaptans. Vaptans act on vasopressin receptors as antagonists. There are multiple receptors for vasopressin (ADH): The V1a, V1b and V2 receptors. The V2 receptors cause antidiuresis, while V1a and V1b receptors cause vasoconstriction and adrenocorticotropic hormone (ACTH) release, respectively. The vasopressin receptor antagonists produce a water loss (aquaresis) without affecting sodium and potassium excretion. Vaptans are the most appropriate physiological approach to treat hyponatremia as they do not deplete electrolytes and restriction of fluids is not needed. They do not stimulate the neurohormonal system and cause no renal impairment. There are both oral and IV preparations available. V2 selective (V2RA): Lixivaptan, Moxavaptan, Satavaptan, Tolvaptan. Only tolvaptan and conivaptan are currently available in India. Treatable causes of Euvolemic Hyponatremia should be excluded e.g. hypothyroidism, glucocorticoid deficiency etc. Vaptans are not recommended as single agents for the treatment of hyponatremic emergencies but could be used as dose-sparing adjunctive therapy with 3% NaCl. Tolvaptan: The efficacy of oral tolvaptan was demonstrated in multicenter trials (SALT-1 and SALT-2) , in 448 patients with hyponatremia caused by SIADH. Tolvaptan significantly increased serum sodium concentration. Even with modest sodium improvement there was significant increase in mental scores. But the effect was not clinically significant and long-term efficacy was doubtful as the patients were followed up for only 30 days. In SALT-2 hyponatremia recurred after discontinuing of Tolvaptan. In SALTWATER trial (Safety and sodium Assessment of Long-term Tolvaptan With hyponatremia Trial to gain Experience under Real-world conditions) the mean serum sodium in treated group was 135 meq/L versus 131meq/L at baseline in patients with SIADH,. and. At 50 weeks, the serum sodium concentration normalized in approximately 60% of the patients.In a multicenter trial (TEMPO 3:4) , a greater than 2.5-fold increase in liver enzymes was more common is study group versus placebo. Thus liver function tests should be performed initially and LFT should be repeated three to four months after initiating therapy and then again at six-month intervals. If liver injury is suspected, tolvaptan should be discontinued. Recently FDA has recommended Tolvaptan use but not for greater than 4 wks. Tolvaptan treatment must be initiated in the hospital so that the rate of correction can be monitored carefully. Patients with a serum [Na"] <125 mmol/L are eligible for therapy with tolvaptan as primary therapy; if the serum [Na"] is >125 mmol/L, tolvaptan therapy is only indicated if the patient has symptoms that could be attributable to the hyponatremia and the patient is resistant to attempts at fluid restriction. The starting dose of tolvaptan is 15mg on the first day and the dose can be titrated to 30mg and 60 mg at 24-h intervals if the serum [Na"] remains <135 mmol/L or the increase in serum [Na"] is <5 mmol/L in the previous 24 h. Serum [Na"] concentration should be measured during the active phase of correction of the hyponatremia at a minimum of every 6 to 8 h. Fluid restriction should not be used during the active phase of correction, thereby allowing the patient's thirst to compensate for vigorous aquaresis. Appropriate caution should be exercised in patients treated with tolvaptan for hyponatremia for extended periods (e.g. >30 days) due to risk of liver damage, but this decision should be based upon the clinical judgment of the treating physician. Patients who are refractory to or unable to tolerate or obtain other therapies for hyponatremia and in whom the benefit of tolvaptan treatment outweighs the risks, remain candidates for long- term therapy with tolvaptan; but in such cases, liver function tests should be monitored carefully and serially (i.e. every 3 m) and the drug discontinued in the event of significant changes in liver function tests (i.e. 2 times increase in ALT beyond upper limit). Vaptans can be used in CHF patients for management of fluid overload and/or hyponatremia after water restriction and diuretics have been tried. Hyponatremia in CHF is chronic and should be corrected till serum Na is normal and symptoms improve.The level of serum Na should be normalized so that diuretic therapy for CHF can be optimised. In some studies , hyponatremia was associated with increased mortality and increased rate of re-hospitalization in patients of acute heart failure. , Short-term trials like EVEREST (Efficacy of Vasopressin antagonist in hEart FailuRE outcome Study with Tolvaptan)  and ACTIV in CHF (Acute and Chronic Therapeutic Impact of Vasopressin antagonist in Congestive Heart Failure)  showed a rapid increase in serum sodium and improvement in hemodynamic parameters with vaptans, however long-term trials have failed to demonstrate a favorable effect on morbidity and mortality. Further studies of the Vaptans are necessary to determine whether serum sodium normalization will be translated into a better long-term prognosis in patients with CCF. Contraindications to vaptans-Vasopressin receptor antagonists should not be used in hyponatremic patients who are volume depleted. Vaptans should not be used to treat the type of euvolemic hyponatremia caused by emetic stimuli or secondary adrenal insufficiency and they are ineffective in the vasopressin-independent form of SIADH (caused by an activating mutation of the V 2 receptor). They are ineffective where AVP levels are appropriate, for example, cerebral salt wasting and psychogenic polydipsia. Thirst, Dryness of mouth, Orthostatic hypotension, Encephalopathy. Acute Kidney Injury, Hyperkalemia and Conivaptan is a potent inhibitor of cytochrome P450 3A4 (CYP3A4), which could lead to serious drug-drug interactions. Tolvaptan has less potential for drug-drug interactions. Coadministration of conivaptan with potent inhibitors of (CYP3A4), such as ketoconazole, itraconazole, clarithromycin, ritonavir and indinavir is contraindicated. Weight, serum sodium, Blood pressure, liver functions should be monitored every 15 days for 2-3 months then monthly. Serum potassium and kidney functions should be monitored regularly. Hyponatremia is a frequently encountered problem in clinical practice and is an important cause of morbidity and mortality. Establishment of etiology and appropriate treatment improves outcome. A knowledge of recent guidelines of treatment and the appropriate use of vaptans is essential for all clinicians for proper diagnosis and management. 1. Verbalis JG, Goldsmith SR, Greenberg A, Korzelius C, Schrier RW, Sterns RH, et al. Diagnosis, evaluation and treatment of hyponatremia: Expert panel recommendations. Am J Med 2013;126 Suppl 10:S1-42. 2. Upadhyay A, Jaber BL, Madias NE. Incidence and prevalence of hyponatremia. Am J Med 2006;119 Suppl 1:S30-5. 3. Renneboog B, Musch W, Vandemergel X, Manto MU, Decaux G. Mild chronic hyponatremia is associated with falls, unsteadiness and attention deficits. Am J Med 2006;119:71.e1-8. 4. Nguyen MK, Ornekian V, Butch AW, Kurtz I. A new method for determining plasma water content: Application in pseudohyponatremia. Am J Physiol Renal Physiol 2007; 292:F1652-6. 5. McDonald DA. Effects of protein and triglycerides on serum sodium and potassium values obtained by the Kodak dry film potentiometric technique. Can J Med Technol 1986;48:146. 6. Hillier TA, Abbott RD, Barrett EJ. Hyponatremia: Evaluating the correction factor for hyperglycemia. Am J Med 1999;106:399-403. 7. Schrier RW. Body water homeostasis: Clinical disorders of urinary dilution and concentration. J Am Soc Nephrol 2006;17:1820-32. 8. Adrogué HJ, Madias NE. Hyponatremia. N Engl J Med 2000;342:1581-9. 9. Adrogué HJ, Madias NE. The challenge of hyponatremia. J Am Soc Nephrol 2012;23:1140-8. 10. Ashraf N, Locksley R, Arieff AI. Thiazide-induced hyponatremia associated with death or neurologic damage in outpatients. Am J Med 1981;70:1163-8. 11. Schwartz WB, Bennett W, Curelop S, Bartter FC. A syndrome of renal sodium loss and hyponatremia probably resulting from inappropriate secretion of antidiuretic hormone. Am J Med 1957;23:529-42. 12. Ellison DH, Berl T. Clinical practice. The syndrome of inappropriate antidiuresis. N Engl J Med 2007;356:2064-72. 13. Maesaka JK. An expanded view of SIADH, hyponatremia and hypouricemia. Clin Nephrol 1996;46:79-83. 14. Decaux G, Genette F, Mockel J. Hypouremia in the syndrome of inappropriate secretion of antidiuretic hormone. Ann Intern Med 1980;93:716-7. 15. Stuart CA, Neelon FA, Lebovitz HE. Disordered control of thirst in hypothalamic-pituitary sarcoidosis. N Engl J Med 1980;303:1078-82. 16. Chute JP, Taylor E, Williams J, Kaye F, Venzon D, Johnson BE. A metabolic study of patients with lung cancer and hyponatremia of malignancy. Clin Cancer Res 2006;12:888-96. 17. Flegel KM, Cole CH. Inappropriate antidiuresis during carbamazepine treatment. Ann Intern Med 1977;87:722-3. 18. Rao KJ, Miller M, Moses A. Water intoxication and thioridazine (Mellaril). Ann Intern Med 1975;82:61. 19. Campbell GA, Rosner MH. The agony of ecstasy: MDMA (3,4-methylenedioxymethamphetamine) and the kidney. Clin J Am Soc Nephrol 2008;3:1852-60. 20. Steele A, Gowrishankar M, Abrahamson S, Mazer CD, Feldman RD, Halperin ML. Postoperative hyponatremia despite near-0.9% NaCl infusion: A phenomenon of desalination. Ann Intern Med 1997;126:20-5. 21. Palmer BF. Hyponatraemia in a neurosurgical patient: Syndrome of inappropriate antidiuretic hormone secretion versus cerebral salt wasting. Nephrol Dial Transplant 2000;15:262-8. 22. Kilpatrick ES. Disorders of sodium balance: Hypothyroidism and hyponatraemia: An old wives′ tale? BMJ 2006;332:854. 23. Schrier RW, Bichet DG. Osmotic and nonosmotic control of vasopressin release and the pathogenesis of impaired water excretion in adrenal, thyroid and edematous disorders. J Lab Clin Med 1981; 98:1-15. 24. Ayus JC, Arieff A, Moritz ML. Hyponatremia in marathon runners. N Engl J Med 2005;353:427. 25. Hew-Butler T, Ayus JC, Kipps C, Maughan RJ, Mettler S, Meeuwisse WH, et al. Statement of the Second International Exercise-Associated Hyponatremia Consensus Development Conference, New Zealand, 2007. Clin J Sport Med 2008;18:111-21. 26. Fox BD. Crash diet potomania. Lancet 2002;359:942. 27. Hariprasad MK, Eisinger RP, Nadler IM, Padmanabhan CS, Nidus BD. Hyponatremia in psychogenic polydipsia. Arch Intern Med 1980;140:1639-42. 28. Alexander RC, Karp BI, Thompson S, Khot V, Kirch DG. A double blind, placebo-controlled trial of demeclocycline treatment of polydipsia-hyponatremia in chronically psychotic patients. Biol Psychiatry 1991;30:417-20. 29. Chung HM, Kluge R, Schrier RW, Anderson RJ. Clinical assessment of extracellular fluid volume in hyponatremia. Am J Med 1987;83:905-8. 30. Verbalis JG, Goldsmith SR, Greenberg A, Schrier RW, Sterns RH. Hyponatremia treatment guidelines 2007: Expert panel recommendations. Am J Med 2007;120:S1-21. 31. Furst H, Hallows KR, Post J, Chen S, Kotzker W, Goldfarb S, et al. The urine/plasma electrolyte ratio: A predictive guide to water restriction. Am J Med Sci 2000;319:240-4. 32. Decaux G, Schlesser M, Coffernils M, Prospert F, Namias B, Brimioulle S, et al. Uric acid, anion gap and urea concentration in the diagnostic approach to hyponatremia. Clin Nephrol 1994;42:102-8. 33. Musch W, Verfaillie L, Decaux G. Age-related increase in plasma urea level and decrease in fractional urea excretion: Clinical application in the syndrome of inappropriate secretion of antidiuretic hormone. Clin J Am Soc Nephrol 2006;1:909-14. 34. Decaux G, Musch W, Penninckx R, Soupart A. Low plasma bicarbonate level in hyponatremia related to adrenocorticotropin deficiency. J Clin Endocrinol Metab 2003;88:5255-7. 35. Sterns RH, Nigwekar SU, Hix JK. The treatment of hyponatremia. Semin Nephrol 2009;29:282. 36. Berl T. The Adrogue-Madias formula revisited. Clin J Am Soc Nephrol 2007;2:1098-9. 37. Oh MS, Uribarri J, Barrido D, Landman E, Choi KC, Carroll HJ. Danger of central pontine myelinolysis in hypotonic dehydration and recommendation for treatment. Am J Med Sci 1989;298:41-3. 38. Mount DB. The brain in hyponatremia: Both culprit and victim. Semin Nephrol 2009;29:196-215. 39. Moritz ML, Ayus JC. The pathophysiology and treatment of hyponatraemic encephalopathy: An update. Nephrol Dial Transplant 2003;18:2486-91. 40. Soupart A, Decaux G. Therapeutic recommendations for management of severe hyponatremia: Current concepts on pathogenesis and prevention of neurologic complications. Clin Nephrol 1996;46:149-69. 41. Sood L, Sterns RH, Hix JK, Silver SM, Chen L. 3% NaCl and desmopressin: A simple strategy for safe correction of severe hyponatremia. Am J Kidney Dis 2013;61:571-8. 42. Greenberg A, Verbalis JG. 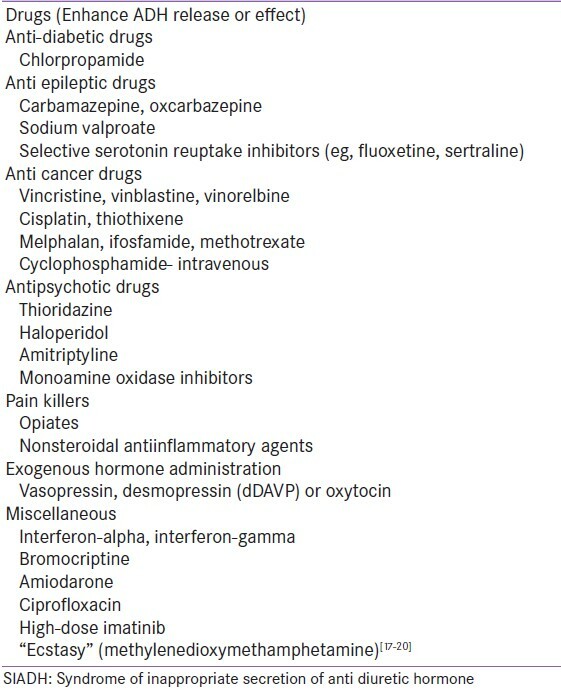 Vasopressin receptor antagonists. Kidney Int 2006;69:2124-30. 43. Jovanovich AJ, Berl T. Where vaptans do and do not fit in the treatment of hyponatremia. Kidney Int 2013;83:563-7. 44. Schrier RW, Gross P, Gheorghiade M, Berl T, Verbalis JG, Czerwiec FS, et al. Tolvaptan, a selective oral vasopressin V2-receptor antagonist, for hyponatremia. N Engl J Med 2006;355:2099-112. 45. Berl T, Quittnat-Pelletier F, Verbalis JG, Schrier RW, Bichet DG, Ouyang J, et al. Oral tolvaptan is safe and effective in chronic hyponatremia. SALTWATER Investigators. J Am Soc Nephrol 2010;21:705-12. 46. Higashihara E, Torres VE, Chapman AB, Grantham JJ, Bae K, Watnick TJ, et al. Tolvaptan in autosomal dominant polycystic kidney disease: Three years′ experience. TEMPOFormula and 156-05-002 Study Investigators. Clin J Am Soc Nephrol 2011;6:2499-507. 47. Torres VE, Chapman AB, Devuyst O, Gansevoort RT, Grantham JJ, Higashihara E, et al. Tolvaptan in patients with autosomal dominant polycystic kidney disease TEMPO 3:4. N Engl J Med 2012;367:2407. 48. Samsca (tolvaptan): Drug Warning-Potential Risk of Liver Injury. Available from: http://www.fda.gov/Safety/MedWatch/SafetyInformation/SafetyAlertsforHumanMedicalProducts/ucm336669.htm?source=govdelivery [Last accessed on 2013 Jan 28]. 49. Gheorghiade M, Abraham WT, Albert NM, Stough WG, Greenberg BH, O′Connor CM, et al. Relationship between admission serum sodium concentration and clinical outcomes in patients hospitalized for heart failure: An analysis from the OPTIMIZE-HF registry. Eur Heart J 2007;28:980-8. 50. Gheorghiade M, Rossi JS, Cotts W, Shin DD, Hellkamp AS, Pina IL, et al. Characterization and prognostic value of persistent hyponatremia in patients with heart failure in the ESCAPE trial. Arch Intern Med 2007;167:1998-2005. 51. Konstam MA, Gheorghiade M, Burnett JC Jr, Grinfeld L, Maggioni AP, Swedberg K, et al. ; Efficacy of Vasopressin Antagonism in Heart Failure Outcome Study With Tolvaptan (EVEREST) Investigators. Effects of oral tolvaptan in patients hospitalized for worsening heart failure: The EVEREST Outcome Trial. JAMA 2007;297:1319-31. 52. Rossi J, Bayram M, Udelson JE, Lloyd-Jones D, Adams KF, Oconnor CM, et al. Improvement in hyponatremia during hospitalization for worsening heart failure is associated with improved outcomes: Insights from the Acute and Chronic Therapeutic Impact of a Vasopressin Antagonist in Chronic Heart Failure (ACTIV in CHF) trial. Acute Card Care 2007;9:82-6. 53. Ginès P, Wong F, Watson H, Milutinovic S, del Arbol LR, Olteanu D; HypoCAT Study Investigators. Effects of satavaptan, a selective vasopressin V (2) receptor antagonist, on ascites and serum sodium in cirrhosis with hyponatremia: A randomized trial. Hepatology 2008;48:204-13. 54. Wong F, Gines P, Watson H, Horsmans Y, Angeli P, Gow P, et al. Effects of a selective vasopressin V2 receptor antagonist, satavaptan, on ascites recurrence after paracentesis in patients with cirrhosis. J Hepatol 2010;53:283-90. 3 Can you spot SIADH?